Indian Americans, constituting just one per cent of the United States population and considered to be one of the richest ethnic communities after Jews, hope to celebrate Diwali this year with a record number of wins from city councils, state legislatures to the Congress, as millions of Americans went out to vote on Tuesday in the midterm polls. A record number of 11 Indian Americans are on ballot for the US House of Representatives. Of these nine are from the opposition Democratic party and two are Republicans. The four incumbents -- Ami Bera and Ro Khanna from California, Pramila Jayapal from Washington State and Raja Krishnamoorthi from Illinois -- are expected to be re-elected. All are from the Democratic party. In fact they have been so confident that they went out of their constituencies and campaigned for other candidates in various parts of the country as well. Among these included, campaigning for the first time -- Indian American House candidate -- Aftab Pureval from Ohio, Sri Preston Kulkarni from Texas and Hiral Tipirneni and Anita Malik in Arizona. All are from the Democratic party and have chances to flip the elections. The two Republicans in the race for the House are Harry Arora from Connecticut and Jitender Diganvker from Illinois while Shiv Ayyadurai is the sole Indian American running for Senate as an independent. "There is tremendous energy within the Indian American community this election. You can see it in the unprecedented number of candidates who ran for office as well as enthusiasm among Indian American voters, 90 per cent of whom say they plan on voting in this election,” Gautam Raghavan from the 'Impact' organisation told PTI. 'Impact' has been identifying and campaigning for Indian American candidates across the country. According to its tracking system, as many as 103 Indian Americans ran for office in 2018; of these, 79 ran as Democrats, 15 as Republicans, and nine as non-partisan or independent candidates. Of these 50 Indian Americans were on the ballot Tuesday in what is being described as the most competitive mid-term election. The Impact Fund says 30 of the races are competitive. This does not include the 13 Indian Americans including four for the House who are seeking re-election. All 13 are expected to be re-elected. Among these include long-time public servant Kumar Barve, who in 1990 became the first Indian American ever elected to any state legislature. Indian Americans serve in the state legislatures of Arizona, Arkansas, Illinois, Indiana, Kentucky, New York, and Texas. That's about to change, according to 'Impact'. "We are closely monitoring the 30 most competitive races across the country, from City Council to Congress, and are optimistic that we will elect a number of incredibly talented public servants who will expand our ranks and speak up for our community in the halls of power," said Raghavan, who worked in the previous Obama administration. 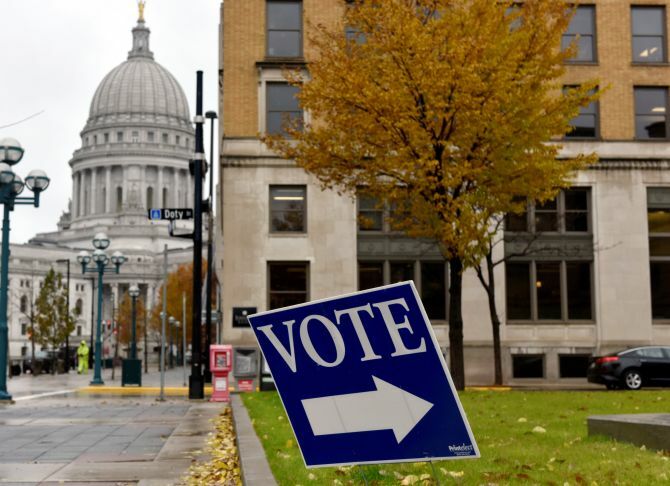 The planning for the next election would begin Wednesday, Diwali day. "Starting tomorrow, we'll start planning for the future with the hope of electing even more Indian Americans to state legislatures, Congress, and perhaps even the Presidency," Raghavan told PTI. Meanwhile Indian American candidates made their last-minute pitch, mostly through social media. In Washington state, Jayapal, the first Indian American woman elected to the House joined her supporters in downtown Seattle for some last-minute rallying. 'Every call and conversation matters!' she tweeted. 'HAPPY ELECTION DAY! Before polls open Team Bera is reminding commuters one thing -- go vote!!' tweeted Bera. "Don't let a busy work schedule prevent you from voting in today's pivotal midterm elections," said Khanna.